This participatory residency offers students an in-depth, interactive experience of how music can convey emotions, tell stories, be a teaching tool to remember information, make deeper impressions of subject material by engaging students’ emotions and creative thought, all while offering an opportunity for personal expression, emotional literacy and curriculum integration. Songs topics can be tied into topics the students are currently learning in class as well as curriculum subjects such as of writing, history, science and social studies. 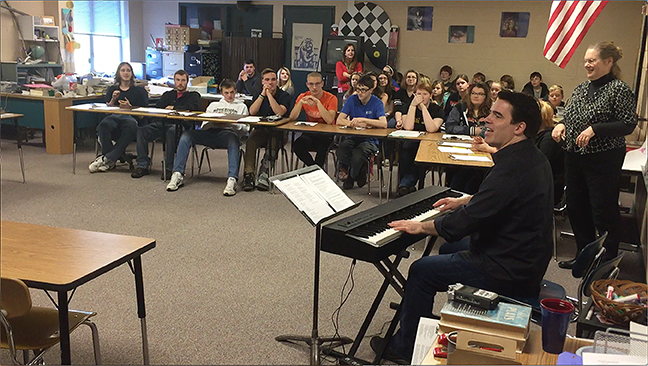 In this residency, students integrate these topics into lyrics, then hear their lyrics transformed into songs performed by professional musicians – right before their eyes in the classroom! The students are deeply involved with the creation of music right in their classroom - adding input about how they imagine their song should sound: telling the band what they feel should be the mood, tempo and style of the piece. In addition to hearing the ensemble's vocalist sing their words, they will have the opportunity to recite their lyrics & poetry with the ensemble in the classroom and at a culminating performance. The final performance can be recorded so the students can have documents of their music! Daniel and his band members are all very responsive and receptive to working with students and non-musicians. They make them feel very comfortable and have shown that they want to make sure the student/collaborators have a positive musical experience. Students DO NOT have to be music students. Daniel most recently completed residency was with an 8th grade English class. This residency focuses on the act of "Arts Making" (from the NYC Blueprint for Teaching and Learning in the Arts) and curriculum subjects the students are studying can be integrated into this project. How to conduct an interview: Daniel shows participants how to prepare for and record an audio interview using the StoryCorps app on their smartphone. He will discuss interview technique and how to listen with empathy. Create a “light painting” photo: Participants will work with members of the Seeing with Photography Collective to conceive, stage and create their own light painting photograph. Creating and scoring music to photo montages: Daniel will demonstrate how he created the photo montages and explore the chemistry between image and music. Music students will have an opportunity to improvise music to images onscreen. Improvising with the Elements of Music: Daniel will explore improvisation with student musicians as they use pieces they are familiar with as a jumping off point to create their own spontaneous compositions. Conversation with blind photographer: Participants will have an informal discussion with member(s) of the Seeing with Photography Collective about their experiences with blindness and what making photos means to them. This highly interactive performance can be adapted for grades 3-12 and offers several curriculum tie-ins in English, History, Creative Writing and Drama.